Alliance for Green Heat, Sept. 25, 2013 - According to recently released U.S. Census statistics, 63,566 more families used wood or pellets as a primary heating fuel in 2012 compared to 2011, which amounts to an increase of 2.6%, making wood again the fastest growing heating fuel in America. From 2000 to 2010, wood and pellet home heating grew by 34%, faster than any of the other heating fuels, including solar and natural gas. Oil and propane use declined between 2000 and 2010, and the decline continued in 2012. Today, 2.1% of Americans use wood or pellets as their primary heating fuel, up from 1.6% in 2000. An additional 7.7 % of U.S. households use wood as a secondary heating fuel, according to the 2009 EIA Renewable Energy Consumption Survey. Nearly 2.5 million households use wood as a primary heating fuel, making it, by far, the dominant residential source of renewable energy in the United States. In comparison, only about 500,000 of U.S. homes have solar panels and less than 50,000 use solar thermal heating. Solar thermal heating dropped by 2% in 2012 from 2011, according to the new Census numbers. The states with the biggest growth in wood heat from 2011 - 2012 are Delaware (35.1%), Rhode Island (29.6%), Nebraska (24.6%), New Hampshire (18.5%) and New Jersey (17.7%). However, other states experienced declines. Among the important wood heating states of Washington, Oregon and California, the decline was very small, but there were more significant declines in Illinois (5.2%), Idaho (5%) and Colorado (4.8%). Over a 12-year period, the prevalence of wood heating has increased, often very significantly, in every state except Louisiana, Mississippi, Florida and Hawaii. Since the U.S. Census Bureau started tracking heating data in 1950, wood heating has had wide swings. Starting at 10% of the population in 1950, it dropped to 1.3% of the population in 1970, an all-time low. By 1990, wood had climbed back to 3.9%, only to drop back to 1.6% in 2000. The biggest growth story in heating fuel is electricity, which went from under 1% in 1950 to 36% today. The environmental costs of using electricity for heating is high in most states, where the majority of electricity is still made with coal. The environmental cost of drilling and transporting other fossil fuels like oil and gas can also be high. Wood heating has an environmental cost from the particulate matter in the smoke, particularly from older stoves in more densely inhabited areas, and, in some states, from growing numbers of outdoor wood boilers. The EPA has proposed stricter emission standards for wood and pellet stoves and boilers and the Office of Management and Budget is reviewing them now. Some of the growth in wood heating can be attributed to households that already had stoves, but now use them as primary heaters, instead of a secondary ones. Other households may have bought and installed stoves they found on the second hand market, which is legal in all states except Washington and Oregon. The trend towards greater use of wood and pellets is mainly due to the lower operating costs compared to oil, propane and electricity. Three states – New Hampshire, Massachusetts and Maine – have provided generous rebates for pellet boilers to help residents replace costly oil heating systems and keep their heating dollars local. Maryland recently established a rebate for the cleanest wood and pellet stoves for rural homes that do not have access to natural gas. 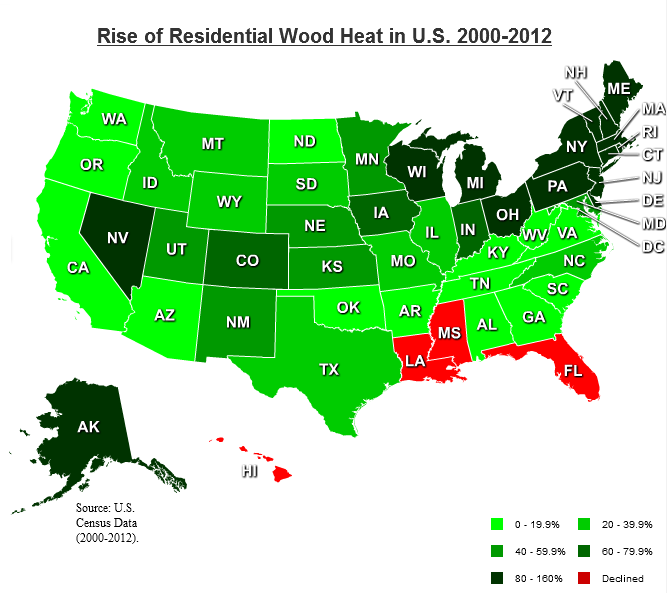 For more info on 2012 U.S. Census data and on trends from 2000 - 2010, and more details about wood heat in the 2000 – 2010 Census. Why let forest fires take all the wood? Wood heat in efficient wood stoves are the best way to heat and that includes for the environment. If it was so bad for the environment, why wood the Forest Service and BLM let fires burn in wilderness areas? "Why wood the Forest Service and BLM let fires burn in wilderness areas?" Because no one lives there and no one's health is at risk there and the cost is too great to stop them. Additionally, natural fires can help reduce extreme forest fires which mean even more pollution that can actually reach areas with dense populations. Burning with wood is not good for the environment or health. It is a significant source of PAHs that deposits in water bodies. It also the fine particulate CAUSES thousands of deaths in the US per year.